This is a demonstration of the use of the Easy Event Hosting name tag organizers system – also known as the Name Tag Tamer (or Tamer for short). This simple system allows you to travel to your event with all of your name badges fully organized and alphabetize in advance. 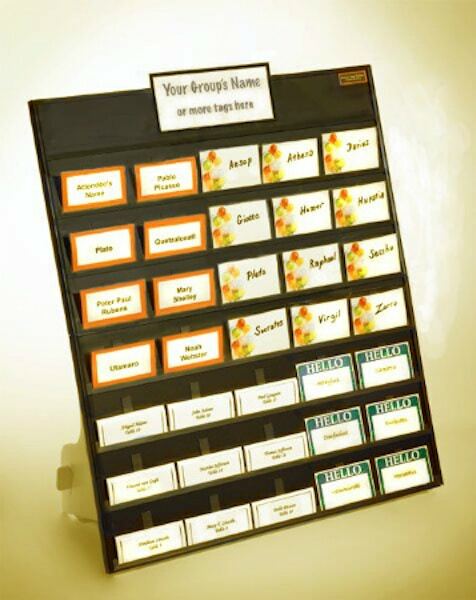 Preparing and organizing for your seminars, meetings, and events is easier than ever when using the name tag organizers. If you don’t like the video or prefer more details and want to review the instructions, then continue reading below. This collection is composed of three different name tag organizers. The full size Name Tag Tamer comes with a plastic edge or the Name Tag Tamer Wood Frame options comes with a beautiful choice of Mahogany or Oak. Then there is the Travel size, and the Lobby size. 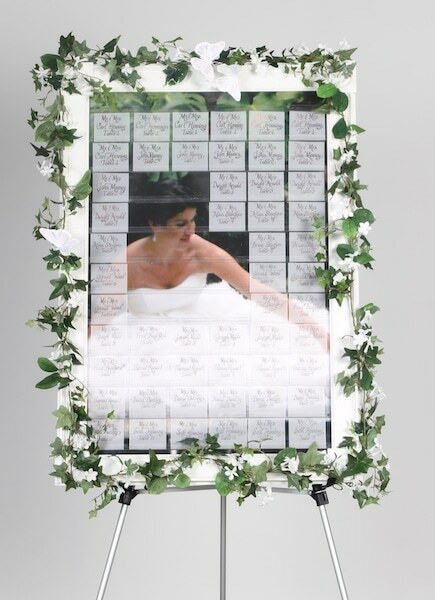 (Note: A fourth option, the Celebration Seating Board, is now available and designed for weddings and other special occasions.) 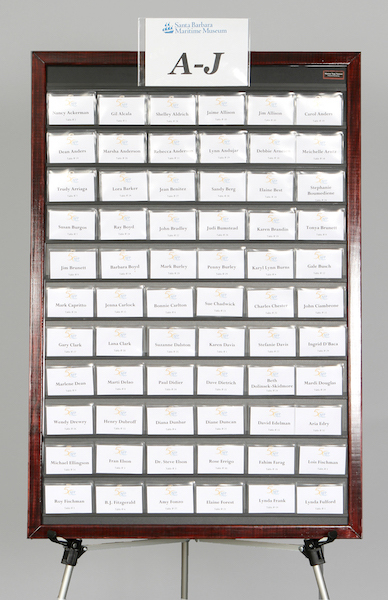 The name tag organizers are designed to be used in tandem as a system of multiple units or as individual boards to accommodate your particular needs – be it for a group of twelve or an event for hundreds of guests. The name tag organizers can be used with an assistant host or allowing your guests to quickly find their own name badges at the event. Now we will continue with the use and preparation of the large Name Tag Tamer. This comes in handy carrying case with the name pouch that can be customized for your organization or event. To open up the handy case, set it on a flat surface, pop-up the velcro tab in the back and then using the handle slowly lower the case onto a flat surface. Then opening up a case will reveal your name tag board. 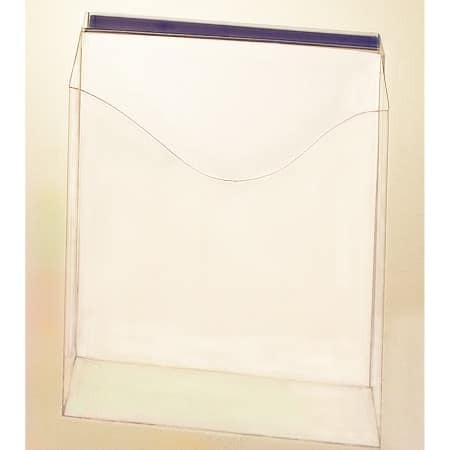 Use the lift assist bubble wrap to provide access to the name tag board and lift it out of the case using the edges. At the back disconnect the two sides of the small bungee cord. Then you can place your name tag holder onto the easel or other device where you will be displaying your name tags. Then reattach the loose ends of the bungee cord around the legs of your easel securing it in place for movement side to side or vertically. Now you’re ready to load your Name Tag Tamer. Your name badges must be the clip style of name badge. This allows the clip to attach to the clip magnet fasteners on the name tag board. You turn the clip to the vertical position and then you slide the bottom edge of the name tag into the alignment groove and click it on to the clip attaching magnet at the back, which secures it. You can move it slightly left or right to adjust your name tag. Then you repeat that same process with all of your name tags in alphabetical order from left to right and then from top to bottom. A full large Name Tag Tamer will carry 66 name badges of the size 2 1/4 x 3 1/2”. 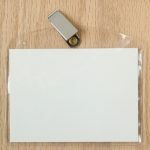 If you’re using the larger name badges, 3“ x 4“ it will carry 55 name tags. If you have more than 66 or 55 guests at your event or meeting you can use multiple name tag organizers to accommodate your guests. 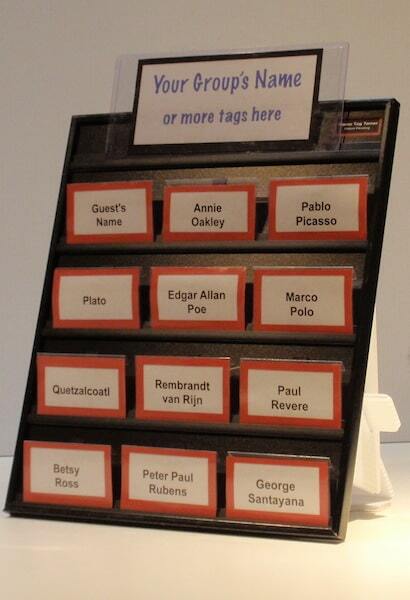 Each Name Tag Tamer has a row at the top without magnets where you can put signage to indicate the last name letters that are on a particular board or you can also use this area for signage of your event, your event logo, or your organization name. 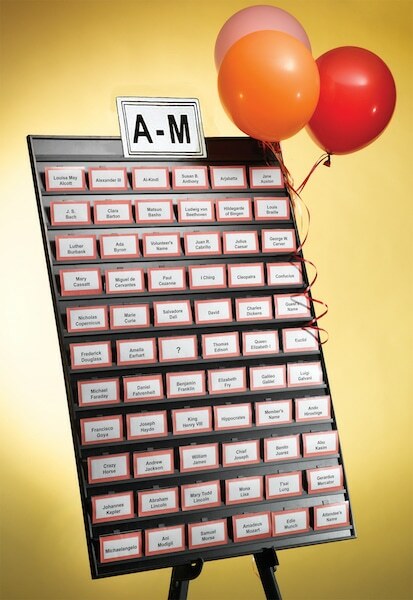 So you can see how if you arranged a series of name tag organizers on easels you could accommodate a larger group for registration and eliminate the inefficiencies of a registration table or bottlenecked registration process. With the Name Tag Tamer out of the handy carrying case you have access to the convenient storage compartment. 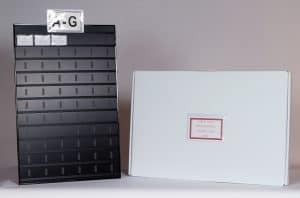 By lifting up the lower panel you will see that you have space in your carry case for extra supplies, extra name tags, and even the separate accessory, the Easy Event Hosting Literature Holder, which can be purchased separately. This item will also fit on your name tag holder and can be used to announce meeting agendas or other information for your guests. Or if you prefer you can remove the lower deck and collapse the supports spines in the center which will allow you to load two Name Tag Tamers in a single carrying case. Now you’re ready to load you’re prepared Name Tag Tamer into the carrying case. Remove any signage from the top groove of the name tag board and place it in the case storage compartment. Then from the back of the Name Tag Tamer unhook the two bungee cords, and lift the Tamer off the easel. Place it in the lower edge of the case for stability and then reattach the end hooks of the bungee cords. Use the easy assist bubble wrap placing it over the edge of the flap so that you can use it to help remove your Tamer when you get to your event site. Then simply lower the loaded name tag board into the carrying case and then wrap the bubble assist lift over the name badges. Then replace the front tab, lift the top cover over pulling the side tabs in, lower the whole lid and wrap the top cover around using a squeegee motion to adhere the velcro. Now you’re ready to travel to any destination and are prepared for an easy and enjoyable start to any event. Easy Event Hosting offers various options readily available on the Shop page. 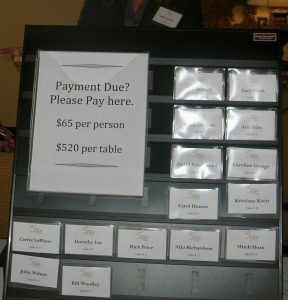 The Name Tag Tamer with Wood option is a particularly nice way to “dress-up” an event and make a great first impression. For custom orders or detailed questions feel free to reach out to us by calling (805) 259-3835 or by completing our contact us form.